I got asked to write an article for Praxis Grundschule in German but then they changed their minds about the whole edition!! So I will simply paste it here for anyone looking for some useful ideas!! PLEASE BE AWARE THAT THIS IS UNEDITED!! Fuzzy, was he? Clear as mud. “What’s this supposed to be? The picture is not clear!” Is there any value in poor-quality or misleading pictures in young-learners’ classroom? A slight mistake in teaching has now turned into a principle: the worse the picture is, the more language learners produce – children talk and think about it. The following article will provide you with a concrete example of how as well as some other ideas for communicative activities based on images. The value of good pictures and their use in scaffolding learners’ understanding of words and concepts is clearly mentioned in many a textbook and through basic searches on the topic. However, adding the word “fuzzy” or “unclear” to the word “picture” or “image” does not turn up anything of use. Here in Switzerland, teachers complain that the pre-made pictures on flashcards accompanying certain textbook are useless as the pictures do not provide a clear example of the lexical item at hand. Yet fuzzy pictures have a great value that will now be revealed to you! What if the goal of the lesson was not to name the objects in the pictures, but to speculate? The following lesson description is based on the teaching of Jim Gill’s song “All Filled Up” from the album Jim Gill Makes It Noisy In Boise Idaho. On Jim Gill's website you can find a song clip and much more. In advance, select the key words from a song you want to introduce. Use the clipart function on Microsoft Word or the Google images option with the clipart filter on to find a picture that represents these words. Choose pictures that are purposefully not clear or that could be one of many things. Graphic 1 shows an example of the words selected from this song. Try it yourself – what could these things be? This could be a …. For beginners, the first two are appropriate and as learners develop their skills, other language of speculation is possible such as “This could very well be a…”. Practice these structures with the children by, for example, having them touch certain known objects (like classroom objects) under a blanket and guessing what they are or doing a simple drill with the entire class. Though perhaps not completely natural, have them use the language support to get used to these structures or have them pay attention to their intonation – “an apple?” or “an apple.” or “an apple!”. Now, present the pictures to the learners. Have children work in pairs or small groups. With the help of a dictionary, have them speculate as to what the pictures could be. If the learners ask if they are right or wrong, then do not respond, just say “keep guessing”! Again, encourage them to use the sentence starters. Have the pictures on the blackboard. Point to a picture and have all the learners say what they came up with. Either the teacher or the learners can write the words up on the blackboard. Graphic 2 is a list of possibilities learners have come up with in classroom setting. Do not worry if the learners do not find one of the correct words – they’ll learn that through the song. The author’s own experience with this activity has shown that children become curious about vocabulary and ask about the difference between jam and marmalade or how to pronounce ‘pear’ or ‘crumbs’. Once these words are on the board, a fun game to play is the hot seat. Have two teams. Place two chairs in front of the board. Have one person from each team sit on a chair with his or her back to the board. Point to a word (or a word for each team using a magnet). The team must then describe the word until the person in the seat has guessed the word. Play this until the learners are tired of it. 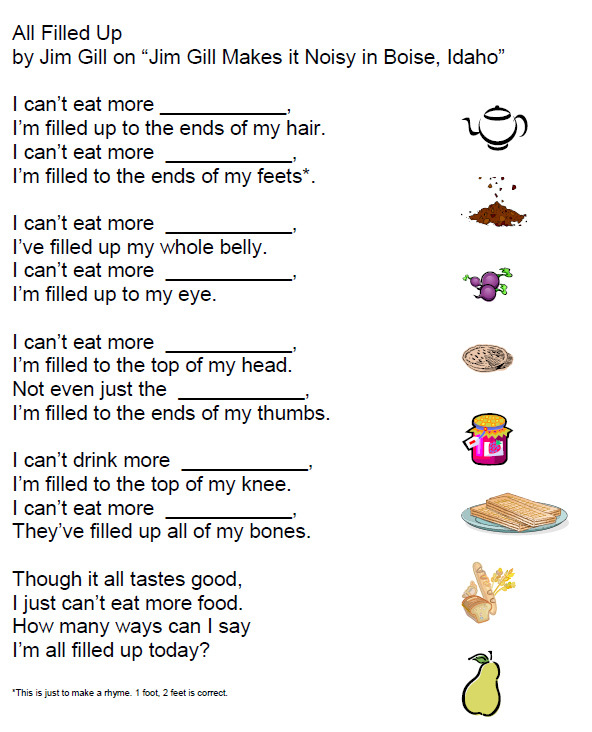 Now hand out the song worksheet (below). 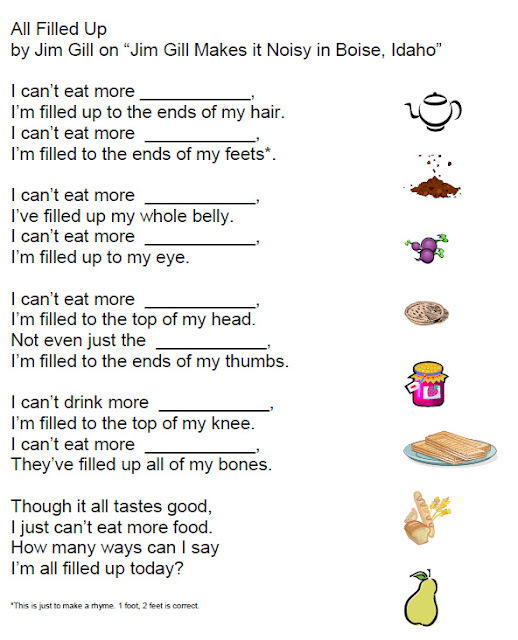 Have the learners read through the text, see if they can find the missing word and match the picture to the gap. Play the song once or twice to find the answers. Play the song again so everyone can sing along. The purpose of this activity was clearly to exploit fuzzy pictures for vocabulary development and for the guessing what something could be – which is useful in many a real-life context. Other options on unclear flash cards are for the learners to take ownership by adding on to pictures, emphasizing or re-drawing what is not clear. When working with self-made flash cards, what one learner draws may not be clear to someone else in the class, so swapping cards sets and guessing words can be useful in this context.